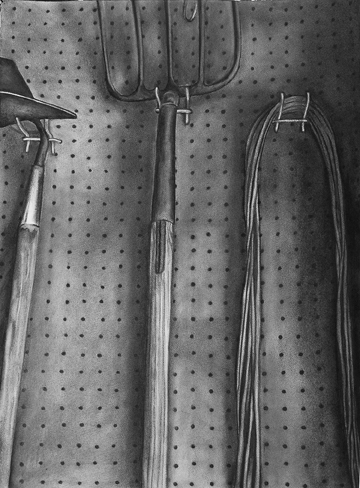 Several years ago, when his disease was first diagnosed, I did a series of four large, charcoal drawings of his gardening tools. I have many memories of him working in his garage with saws and hammers; hoes and rakes. I’m sure this influenced my study and love of art, especially sculpture. 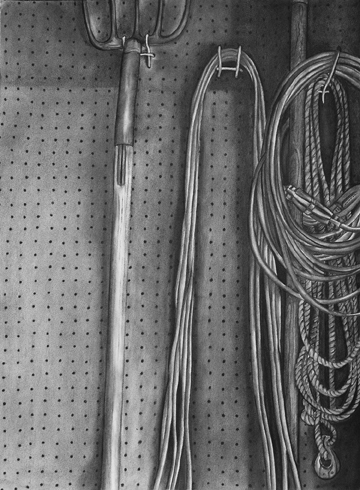 His tools, hanging on stained pegboard, were symbolic of him and I wanted to document them before they were gone through an estate sale or passed down to friends and family. Many people never get to watch death happen this closely in front of their eyes. With a child’s curiosity I’ve watch a butterfly’s wing flap for the last time on the edge of a hot patio. I’ve watched three pet cats die and each time it broke my heart. Every day I feel my heart about ready to collapse, and every day I wake up and I’m still here and decisions have to be made. I’m praying that my gray hairs won’t start yet, but they might. I find I’m spending more and more time with my brother, his wife and my niece and nephew. It is such a blessing. There’s simply no one else who can relate so fully to my pain and my joy. It took me many years to realize this, but I’m making up for lost time. “It’s incredibly hard to see a parent gradually age and die. In some ways, I think it is God’s mercy. It doesn’t seem merciful because of the inevitable deterioration of the body and the physical pain our parent(s) have to endure, but in some ways, it prepares them to die. They become tired of this life and are “ready to go”. It also helps prepare the siblings and family because it is painful to watch parents deteriorate and suffer. One also becomes “tired” of the stress of worrying or caring about the aging parent, even if one isn’t the main caretaker. It is hard to make future plans (Should I take this trip? Should I move?). It is mentally tiring to worry about them. (Should I go see them this weekend? Do they have what they need?) Both parent and children feel “on hold” with their lives. There are also the “false alarms.” Sometimes a trip to the hospital that seems like the “last time” ends up not being so because often, meds and trained caregivers perk them up again. And the cycle starts all over. The merciful part is both parent and adult children have a chance to say good-by. By the time the end really DOES arrive, there is often a great sense of relief….and grief, of course. It is interesting how one is always surprised at death. You know it is coming but it is always a shock when it arrives. As I’ve watched and waited, I realize, even without words, he is still teaching me things. Life is precious; don’t waste it. Make the most of it. Do all you can to help the worlds’ hurting people by loving in the way that only you can do. Have no regrets. Count your blessings. Go after your dreams. Love as big as you can and learn to receive love. Sometimes there’s not a second chance. Don’t let fear hold you back. Give yourself away. It’s a big world, explore and observe. Always, always be grateful and never, never stop believing. I happened upon this post in my travels around the blogosphere as I wait for files to zip or move (I’m working, sort of). Having been through my father’s death when I was 11 and now my 89 year old mother starting to slip away….I don’t like either! But I guess that makes me human. When I have heard and read of people watching their loved one die gradually I am thankful I didn’t have to experience that with my father. On the other hand, as I embark tomorrow to assist my 89 year old mother, watching her slip away is quite difficult 😦 What makes it even harder is that none of us kids is physically close to her so none of us will watch the gradual deterioration. I am thankful for that and yet…..each time I see her I can tell there’s a difference. And now her memory seems to be drifting away as well. Thank you for sharing this post about your father. It’s given me things to think about. I love your charcoal drawings – what a nice tribute to your father. Thank you so much for your comment. “This” is a part of life that I never really, deeply thought about. I mean, of course, we think about dying, and we know we will die, and my faith is based upon this fact, but I never saw death face to face like you did when you were 11. Meeting death through someone close to you changes things, doesn’t it? Gosh, I could have a loooooonnnnngggggg conversation about these things!! I hope the time you spend with you mother is precious. Say all that needs to be said. Even if it feels uncomfortable/weird whatever. Say it!! If she continues to live, and her memory is fading, it will only get worse. On another note, I am looking forward to looking over your blog! Stay in touch! oh thank you so much. yes, seeing death so early up close and personal-like was difficult indeed. but with all things, you learn to adjust eventually. Life’s too short for regrets but…..I wish I could have had my father walk me down the aisle. Obviously it was out of my control and my brother was a nice substitute 🙂 I’m a bit nervous about seeing my mother tomorrow….not sure I will like what I see. I’ve been thinking alot about how maybe the losing of one’s memory might be a blessing in disguise for her? I appreciate your comments and I’ll do my best to enjoy her while I’m there. Amongst trying to figure out what kind of care she needs. Thanks again, I look forward to reading more of your blog! This is a reminder of what a privilege it is to be there as one prepares to step into the gates of heaven. It is hard to let go because you will be left behind. There is a space in your life that is empty. Your history is gone. We feel sorry for ourselves. At the same time we rejoice for our loved ones. They are free from fear, pain, and sadness. They know everything, they are in the glory of God. Beautiful! Thanks for sharing your heart! Anita, I have loved your weekly blog, but today’s posting was special. It was sad, beautiful, poignant, happy, heartbreaking, all rolled together. Your use of the words painted a picture so plain that your feelings became universal. Your Dad would have been so proud and pleased if he could have understood and I loved what David said on facebook: “if you like to think and feel. then you will enjoy following my sister’s blog”. I will treasure it always. Mom . What sweet remembrances of your Dad! I love the “give people flowers while they’re living!” That is so good! See you in a few . . . love you too! Anita, my heart goes out to you. Thank you for sharing your feelings and observations about your dad. It’s so heart-wrenching. You’re right, the opportunity to say all you want to say before your loved one leaves is a blessing. You’re in my prayers. Roseanne! Thank you so much for writing! I know you understand. Thank you for keeping me and my family in your prayers. Blessings to you, sweet friend. When you get to this page, click on each drawing and they’ll open up larger. Tell your husband to hang in there. It’s a difficult thing to say goodbye. Big hugs back to you and him. Sending big hugs, Anita! I’ve been helping my husband slowly say goodbye to his parents. It’s not easy. Your post is such a beautiful nod to your dad. I loved your charcoal sketches. They’re exquisite! Do I see shadows? I’m now thinking of my dad’s basement and yes, pegboard. I’m now also thinking of my grandfather and his pegboard, along with this hands and sweat. I used to watch him work. Warm memories. Thanks for that. Maybe you’ll post the other two works? Again, big hugs for you and your family. T.